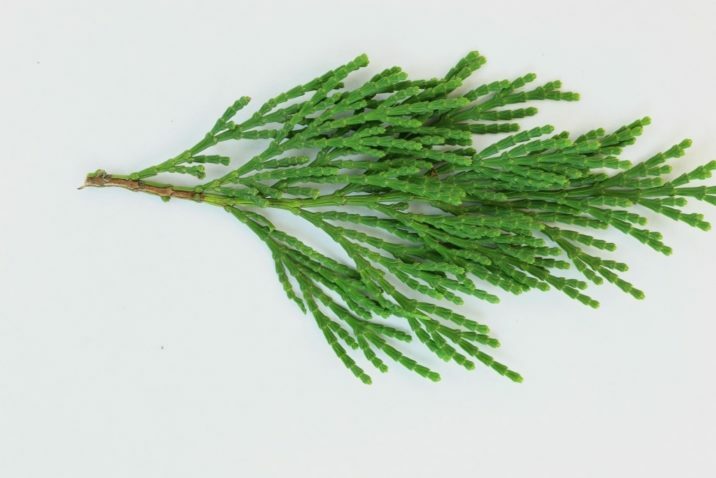 Calocedrus decurrens, as described in 1956 by John Torrey (1796–1873), Carl Rudolf Florin (1894-1965), in Taxon, vol.5:192, is commonly known as California incense-cedar, or California post-cedar; as well as cedro incienso in the Spanish language. In the Latin language, "decurrens" translates into, "hanging down the stem," which describes how seed cones are produced in this species. Ethnobotany. 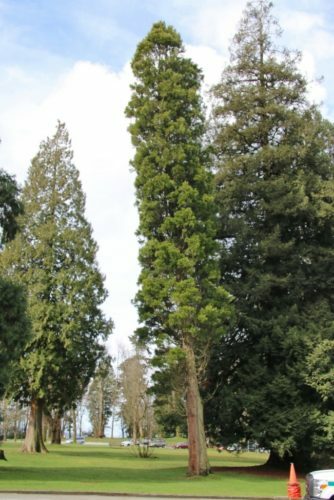 The tree is widely grown as a valuable ornamental landscape tree. Formerly it was also an important timber species, much preferred for the manufacture of pencils due to its softness and isotropy. 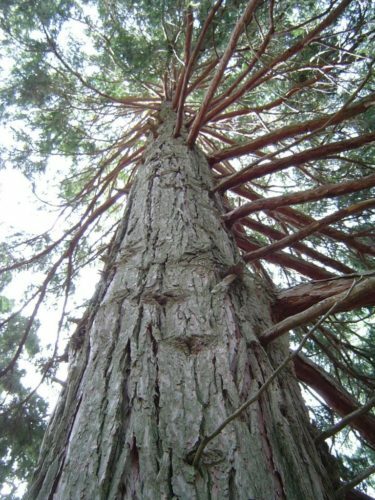 Although timber harvests have been reduced by depletion of old growth stands, its wood, exceptionally resistant to decay and highly durable when exposed to weather, is still useful for woodworking applications including cedar chests and closets. Description. California incense-cedar is a large, resinous, aromatic, coniferous species of tree, typically growing to mature heights of 125 to 200 feet (40 – 60 m); with a tapering, irregularly angled trunk of up to 10 feet (3 m) in diameter measuring at breast height; and a broad conic crown of spreading branches. Bark is orange-brown, weathering grayish, smooth at first, becoming fissured and exfoliating in long strips on the lower trunks of old trees. 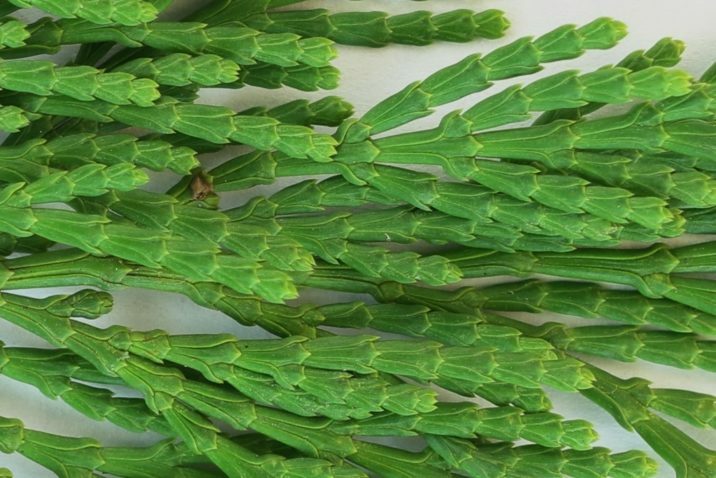 Foliage is produced in flattened sprays of scale-like leaves 0.08 to 0.6 inch (2 – 15 mm) long. They are arranged in opposing decussate pairs, with the successive pairs closely then distantly spaced, so forming apparent whorls of four; the facial pairs are flat, with the lateral pairs folded over their bases. The leaves are bright green on both sides of the shoots with only inconspicuous stomata. 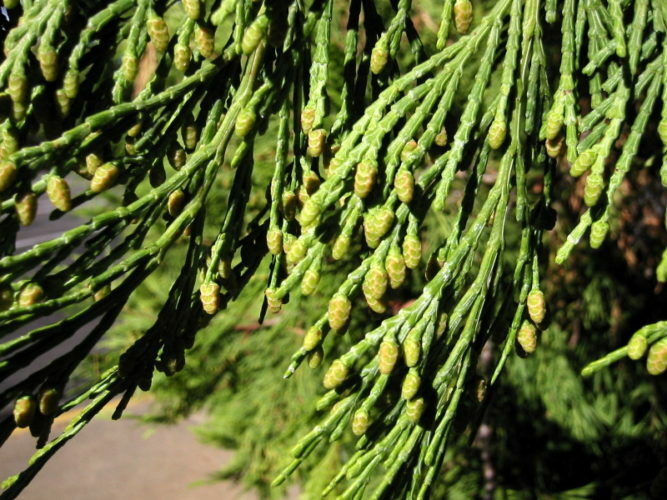 Pollen cones are 0.24 to 0.32 inch (6 – 8 mm) long. colored red-brown to light brown. 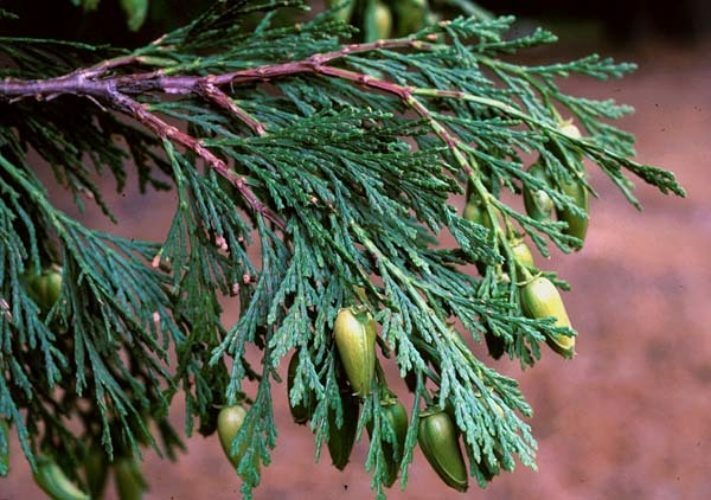 Seed cones are 0.8 to 1.4 inches (20 – 35 mm) long, pale green to yellow in color, with four (rarely six) scales arranged in opposite decussate pairs; the outer pair of scales each bears two winged seeds, the inner pair(s) usually being sterile and fused together in a flat plate. 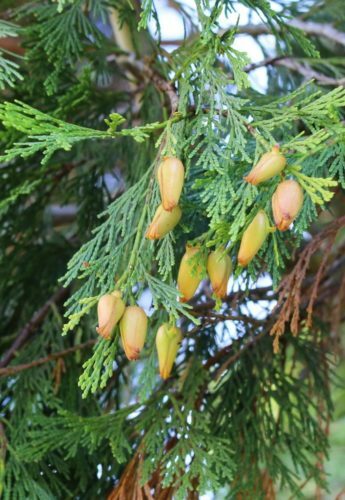 The cones turn orange to yellow-brown when mature about 8 months after pollination. Distribution. This species is native to western North America, with the bulk of the range in the United States, from central western Oregon through most of California and the extreme west of Nevada, and also a short distance into northwest Mexico in northern Baja California. It grows at elevations of 165 to 9,200 feet (50 – 2,900 m) above sea level. Within its native range, the climate is characterized by dry summers, usually with less than 1 inch (25 mm) precipitation per month; annual temperature extremes are from -30° to 118°F (-34° - 48°C). Annual precipitation, part of which is snow, varies from 15 to 80 inches (380 - 2,030 mm), with the driest conditions found near the specie's northern limits in Oregon and northeast California. It grows on an exceptionally wide variety of soils, derived from silicate, serpentine, and carbonate parent materials, and textures ranging from coarse sand to clay. Hardy to USDA Zone 7, cold hardiness limit between 0° and 10°F (-17.7° and -12.2°C). This tree is the preferred host of a wood wasp, Syntexis libocedrii a living fossil species which lays its eggs in the smoldering wood immediately after a forest fire. The tree is also host to incense-cedar mistletoe (Phoradendron libocedri), a parasitic plant which can often be found hanging from its branches. Attribution from: Aljos Farjon; Monograph of Cupressaceae and Sciadopitys; ©2005, Royal Botanic Gardens, Kew. 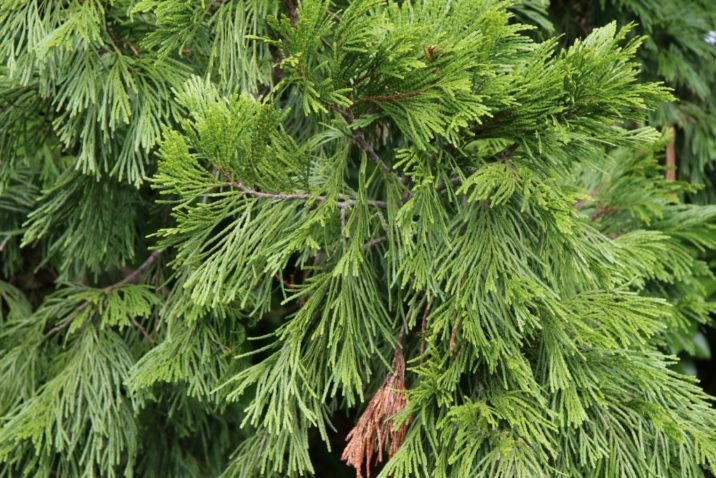 Calocedrus decurrens — closeup of foliage detail; tree at Greenhorn Summit Guard Station, Kern Co., California. 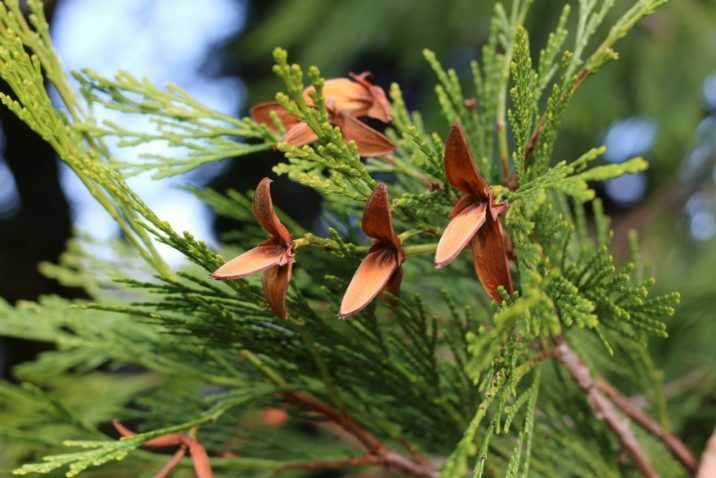 Incense-cedar (Calocedrus decurrens) foliage and pollen cones detail; photographed at the north end of Manzanita Safety Rest Area, north of Grants Pass, Oregon. 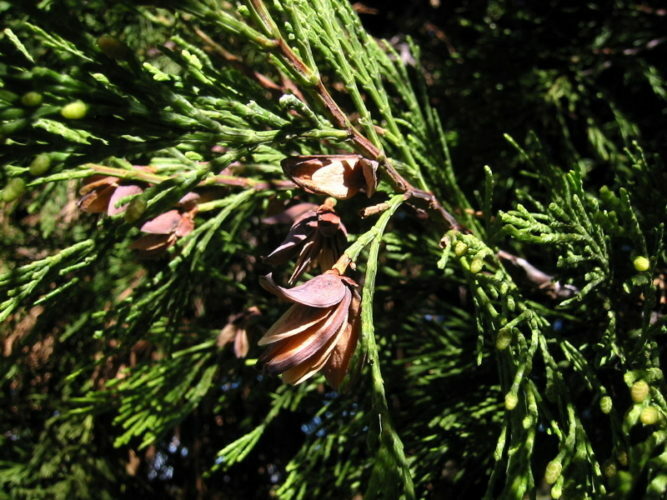 Incense-cedar, Calocedrus decurrens), foliage and mature seed cones detail; photographed at Manzanita Safety Rest Area, north of Grants Pass, Oregon. 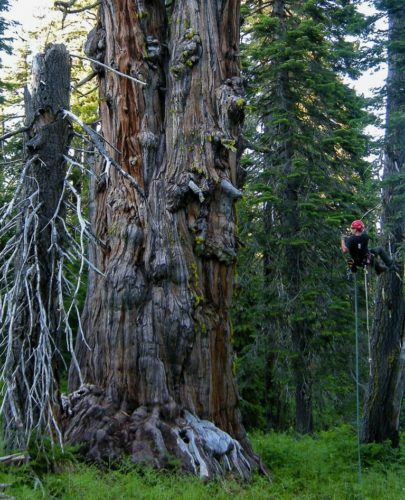 Calocedrus decurrens — the Tanner Lake Giant. 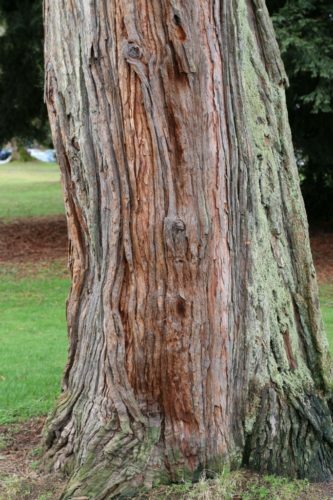 Oregon's State Champion California incense cedar.